If you want to learn to surf or improve your skills and see the scenic views of Australia, this surf holiday is a good choice. Everything will be pre-arranged, so you can relax and let Australian Surf Tours take you on the trip of your lifetime. You can explore, find, and experience new things. Don't miss this opportunity to surf on the great waves of the land down under. Enjoy a delicious daily breakfast at the onsite restaurant! The Beach Motel is aptly named and positioned as it is right across the road from one of the best surfing beaches in the area, Thirroul Beach. The rooms are beautifully renovated for the surf camps and have a maximum of three people staying within, have private bathrooms, kitchenettes, and a fridge so you can chill your beer. The rooms are all serviced twice weekly during your stay with bedding and new towels. There is a common room with pool table, TV (loads of surf videos), and a general place to hang, and being so close to town, you will always have somewhere to explore. At the Sydney surf camp, you will be introduced to surfing the right way. With three different beaches to surf, you are ensured to get the instruction you need and the required conditions to take your surfing to the next level. 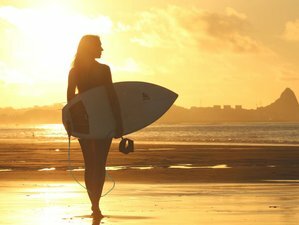 Australian Surf Tours has three licensed beaches in the area so each day, your surf coach along will choose the best place to surf. Over the five-day course, there will be nine two-hour lessons in the water each, with an element of theory and practical. On top of this, there are state of the art cameras to film from below and above. This enables the coaches to hold a video correction session with the guests showing them what they look like when they surf and how they are positioned in the water. Last but definitely not the least, within the surfing program is a trip to a local surfboard factory where you can see the whole process of board manufacturing. You will have a video correction session where you will watch footage of yourself surfing and be critiqued by a professional surf coach. Apart from the hours you spend in the water, you will learn about weather systems, how to read swell charts and oceanography, and how to effectively work with the ocean so your surfing can progress as far as you want it to. You will visit local tourist attractions, climb Illawarra Escarpment, and maybe even jump off a waterfall or two. The aim is to have you surfing better than ever before and experience the best week of your life. The surf camp is located only an hour and fourteen minutes by train from Central Sydney in the heart of Thirroul. The beach is across the road, the pub is down the street and the bank, post office, surf shop, and grocers are all in between. You don't have to walk more than 200 meters in any direction to reach the place you want to visit. Thirroul is a thriving little town on the northern beaches of Wollongong with surfing and live music at its heart. Only 15 minutes by train to the center of Wollongong and an hour to Sydney, it is Sydney's closest and Australia's best-positioned surf camp. Daily breakfast is included in the price. You will be served a continental breakfast everyday with tea, coffee, fruit, cereals, bacon, eggs, and toast so you have the energy to surf for hours. The Beach Motel is also located just two minutes walk to a supermarket where you can get what you need for the rest of the day. For dinner, there are a number of restaurants and pubs around the town or there is the Beach Motel restaurant and bar which serves beautiful food and as an Australian Surf Tours student, it provides you great discounts. Please book your flight to arrive at Sydney Airport (SYD). Trains travel hourly from Sydney Central Station. From Sydney Central Station, take the train going to Thirroul Station. Please inform Australian Surf Tours time of your arrival for pick up and transfer to the beach motel.